From electrical engineer to rocket scientist to astronaut to running a malaria program in Equatorial Guinea, Africa, alumna Joan Higginbotham is just getting started. Higginbotham earned her master’s degree in management from Florida Tech in 1992 and a second in space systems in 1996. She began her career at Kennedy Space Center as a payload electrical engineer and went on to hold a variety of significant positions – actively participating in 53 space shuttle launches over nine years. In 1996 she was selected as an astronaut candidate. 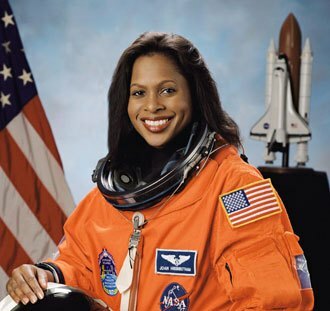 Higginbotham became the third African-American woman to travel to space when she journeyed to the International Space Station aboard the space shuttle Discovery on December 6, 2006. In a recent interview with City Metro, Higginbotham shares her keys to success and her feelings about the movie Hidden Figures. She also describes what life in space is really like – including the “art” of floating.